Drum kits have made a big shift from acoustic to electronic in the years the latter was first introduced in the eighties. There is certainly nothing like good ‘ol cymbals but the best electronic drum sets out there make it rather tricky to distinguish between the two. This speaks volumes for the strides electronic drums sets have made. Moving over to electronic is in a way a natural progression along with the rest of the music scene. However, this may even be the ideal option for beginner musos. Annoyed neighbors the world over are all too familiar with band practice sessions that served more annoyance that they did good music. Electronic drum sets have been the savior in this sense! Investing in a new piece of equipment like this, whether it be for learning or playing professionally can be a little overwhelming, but a way to get around that is to evaluate your needs first, decide on a budget and already you'd be able to narrow your options down. If you already know about electronic drum kits and want to see our favorites, go through the list below and see what we thought. If you are new to the scene, take a look at our buying guide first to help you learn more about what makes a good drum kit and what you should expect. Great setup for a great price. If you are just starting out and want something cheap to get started, this is a great value for the money. 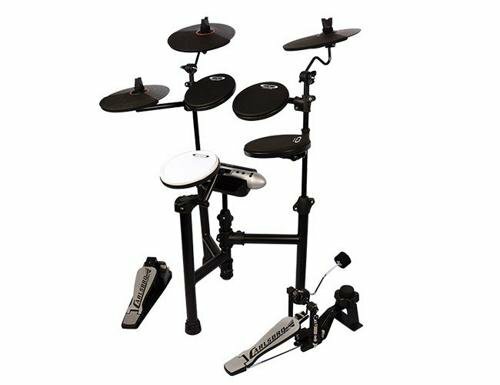 This electronic drum set is easily the best in range at Alesis. This piece of musical equipment packs in the hardware, making it great value for money. With more drums, cymbals, and sounds than your average electronic drum set, you’re given so much flexibility in your musical experiments. You won't have to hold anything back either, as the DM10X features heavy-duty, chrome-plated steel rack with hinged, quick-release clamps. The DM10X’s ‘brain’ or sound module is the true star of this piece of equipment. It is the world's first drum-sound module that enables you to load new sound sets via USB connection from your computer. This will ensure that your module is always current. If you are looking for a step up in your drum kit, the KT4 feels similar to a full acoustic kit and is a great value. You know you’re in good hands when the drum set is made by a company that specializes in electronic percussion technology. 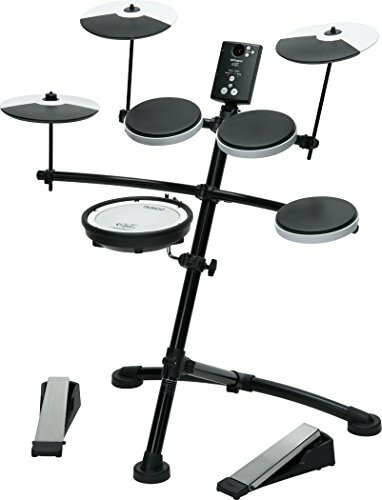 Better still, the KT4 is KAT’s most advanced electronic drum set to date. This 5 piece kit stands out for its look and feel of a classic acoustic set together with the fact that many enhancements and adjustments had been made to ensure that you get that exact play. Perfect for the digital drumming skeptics. A number of exclusive technologies created by Kat Percussion make this electronic drum set a cut way above the rest. For example, the 8-inch Bass Pad fitted with a Mylar® drumhead and a real-time actuating cymbal pad so you have more flexibility with your sound control. More complicated to set up, but full of songs to play along with and over 500 additional sounds to keep you playing. The Alesis brand has established itself as a key innovator in the music production space, making new technologies accessible for the hobbyist musician and people learning the ropes. 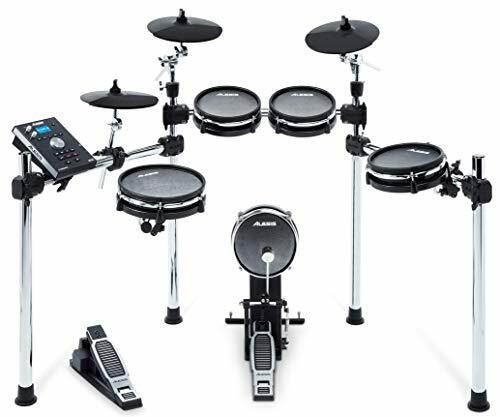 The Alesis Command Kit stands out for its robust 8-piece composition and the addition of exclusive 10-inch mesh snare and 8-inch mesh kick features. These contribute to the authenticity of the drumming experience, a factor often called out in electric drumming sets. The set includes a built-in metronome, allowing you to play around with sounds and improve your skills. What may also helpful in this sense is the Advanced Drum Module, which features 70 drum kits, 60 play-along songs, and over 500 sounds! The only downside for the Alesis Command Kit worth noting was the not-so-easy setup process, but this is not nearly enough to discount its sheer playing ability. Compact and affordable make the Roland a perfect fit for those of you that need to move it around or take it with you on the road. What I love about the Roland TD-1KV bundle is that it comes with all the essentials you need for making music on your own. This is great, especially if it’s your first kit and you’re still in the learning phase. 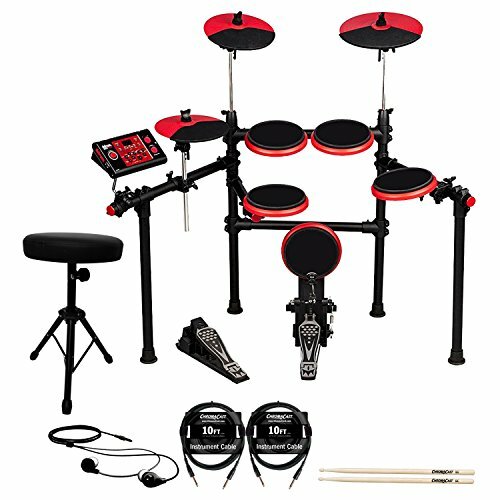 The bundle includes the TD-1KV Electronic Drum Set, Drum Throne, Headphones, Drum Sticks, and 1/8 inch Audio Cable. Even for experienced musicians, this is a worthwhile deal and the specs of the set make it one you can’t ignore. For those of you accustomed to acoustic, this piece of equipment supports basic acoustic drumming techniques, including cymbal choke, advanced Hi-hat playing and the PDX 8 V pad supports that with an electric snare drum feel. For under 500 you get a compact and great sounding kit from a brand that is known for its musical instruments. Yamaha is a brand we’re all well familiar with so that’s already a plus. The Yamaha DTX400K is starkly set apart from the rest with its integration with mobile apps, all produced by Yamaha too. App integration aside, though, this kit is popular amongst both amateurs and experts alike. The high quality finishes expected of Yamaha does not disappoint and the set includes 10 customizable drum kits with sounds including 23 snares, 21 kicks, 31 cymbals, 36 toms and 42 percussions. Another stand out feature is the KU100 Silent Kick Unit that significantly reduces vibration and acoustic noise, making it one of the more quiet drum sets. While its design is sleek and simple, you shouldn’t be fooled into thinking you need to hold back. As expected, Yamaha has built this one to last. Indeed, the migration from acoustic to electronic may not be an easy option for some musicians to follow and that’s fair enough. Those of you amongst them will be happy to know that there are a variety of options available, some of which still give the best of both worlds. You don’t have to give up acoustic completely. Choose from either a full on electric drum set or keep that tad of classic with a drum set that incorporates both. With an almost endless variety of snares, toms, kicks and cymbals and the ability to experiment with music in so many different ways – not just restricted to drums – a full-on electronic drum set is a versatile, convenient piece of musical equipment. 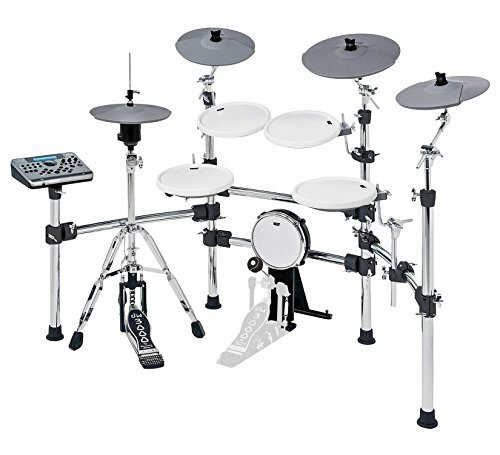 The ease with which you can move between different genres is highlighted by the multiple sounds and sheer variety of choice offered by electronic drum sets. What’s more, you can play from pre-recorded material as well as instantly record as you go along. I’d say electronic drums allows more versatility and ease for making and editing sounds and performances. Its key components include the transducer or trigger pads and the trigger interface. Notes are made when the pad is struck and the transducer sends a signal to the module – and just like cymbals, the harder it is struck, the louder the sound. 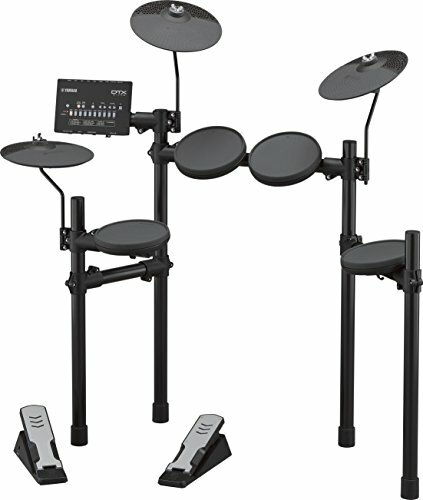 This is a great solution for learning as most of the best electronic drum sets come with free learning software, and either way, the use of pre-set drum patterns will be very handy for first-timers. Fair enough, some seasoned musicians will never be completely satisfied with a completely electronic drum set. For that, there is the hybrid drum option, which allows for the raw power of acoustic sound with the versatility and potential of new technology in electric drum sets. So you get the get of both worlds in pure acoustic sound, which is completely customizable. You can enrich your sound by triggering electronic sounds and mixing these with your acoustic sounds, providing greater dynamic range, clarity, and all-around performance. If acoustic is what you’re used to, you don't need to worry about setup and learning being complicated. Hybrid drum sets are easy to use and where you need to learn anything extra, it’s worthwhile in the end as you’ll be expanding your range in terms of genre, style and technique. 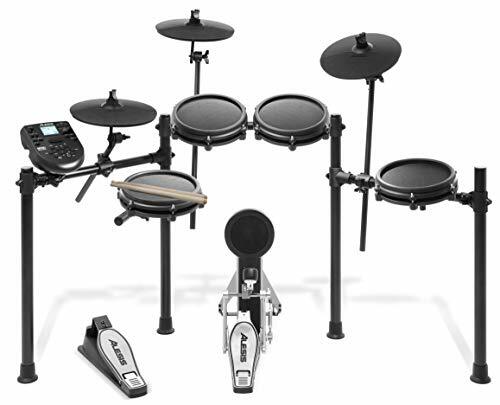 As this electronic drum set review has made clear by now, there is so much variety and it can get a little overwhelming deciding on the right one. I found the video below really helpful in pointing out the little things to look out for before purchasing your kit. Pretty useful, right? Now take a look at the factors below, which I think are the main ones and if you take all of these into consideration, weigh them up against your needs and budget, perhaps the decision will be made a little easier. Rubber or mesh pads. This will affect your output in that mesh pads are more responsive and closer to replicating acoustic drums that rubber would be. It does cost more, though, but your sound quality is also improved quite significantly. Components. The standard 5-piece is made up of a snare, hi-hat, crash, tom and kick and bigger than this would include additions like ride cymbal, extra tom and sometimes even a microphone and seat. Software. The advent of electronic drum sets and musical equipment in general means that there is now a new ‘instrument’ and that is software. Make sure to factor these costs into your budget, if it doesn't come standard with the kit and more importantly make sure you’re comfortable using them. Budget. Because prices vary so broadly across the range, it will help to determine what you're willing to pay beforehand. The features and extra adds will affect what the set will cost, from basic features at entry level prices to more elaborate functionality with prices to match. Appearance. I imagine this to be low on the priority list, but the look of a drum kit could be a big factor for some. If you’re a professional you may have a certain image in mind and you may want your equipment to reflect this. Brand preference. Depending on your use and level of expertise, you may be stuck on a particular brand of choice. You’ll find that even when narrowing down to a brand, the popular ones still offer a variety of kits to choose from – from set pieces, mesh vs rubber to sound and more. I think it’s safe to say that when approaching this project of investing a new electronic drum set, the key is to decide on a budget and how willing you are to be flexible on it. Chances are, you may just be persuaded to loosen that budget a little more once you’ve seen the options available. Equally important is to know what you need the set for – learning; playing around and experimenting or professional use. Of course, your needs will change greatly based on this but we suggest to start out modest and as your progress strengthens, you can move onto something new and more suited to experienced drummers.